NU Honours 1st Year Result Challenge 2018. National University Honours 1st Year Result Board Challenge Application Also known as “Re-scrutiny” / Khata Challenge. After Every Regular, Irregular and improvement Result, The Authority of National University Announce Rescrutiny Application Notice For Students. The NU Last Exam Result Was Published on 19th March 2018. Now Time To Application For Result Challenge Who Want Result Improvement. National University Publish Result but They Also Publish Notice About Challenge Result. We also publish NU Honours 1st Year Result Challenge Notice 2018. So, National University Honours 1st Year Result Challenge Notice Will Publish After The Result Publish. Normally, The NU Publish Notice Within 7 Days After Result Publish. Here You Will Find NU Honours 1st Year Result Challenge Application 2018 Details and Result. NU Published a Notice About Honours 1st Year Result Re-check. Students Who want to Challenge Their Result, They Can Apply Online. National University honours 1st year Result Re-scrutiny Challenge 2018 Will be Complete by Online. National University Honours 1st Year Result Challenge Apply Will be Start From 25 March 2018 at 10.00 pm and it Will be Continue up to 11th April 2018 Before 4.00 PM. Interested Candidates have to Apply Online For Challenge Result of Honors 1st Year. After Complete Application, Candidates have to Pay Application Fee. Application Fee Each Subject BDT 800/-. Application Fee has to Submit to Sonali Bank. See NU Honours 1st Year Result here. 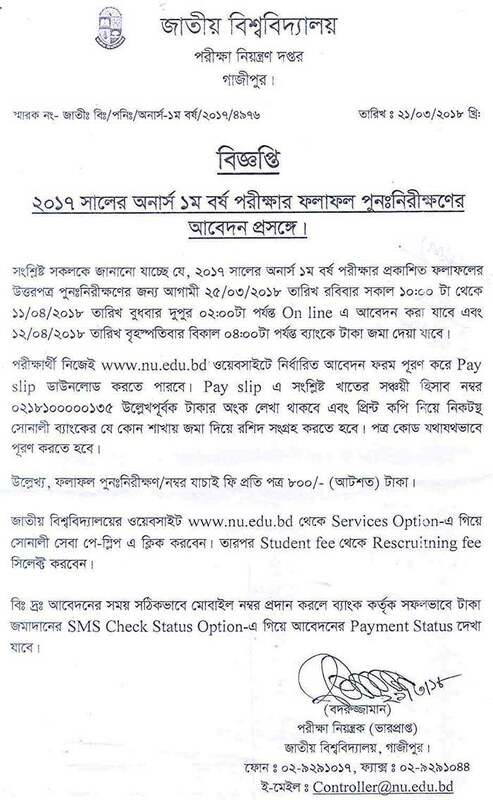 Candidates have to Apply Through Online at NU Official website nu edu bd. At First, go to www.nu.edu.bd and Select Service Menu From the top on Right Side and click “Sonali Sheba Pay Slip” and then Click Students Fee and Click Rescrutiny. Now Fill up Application Form. After Complete Application Form Submit, A Pay Slip Will be Found For Download or Print. Now Pay Result Challenge Fee by Submitting Pay Slip by Sonali Bank. Students Can Pay Fee Every Sonali Bank Branch. NU Honors 1st Year Challenge Result 2018 Will Publish June last week 2018. National University Honours 1st Year Exam Result Re-Check Online Application. Many of Students Will get Desire Result but something of Students wants to overlook Exam Paper by Examiner. Now Bangladesh Reached a Position to Online Based Service. So the Authority of National University Takes Step to Digitization Education System. NU Honors Result Challenge Result 2018 Will be Published After 1 Month of Complete Application. National University Authority Will be Published Result by Sending College Authority. Students have to Collect Result From College Authority. We Also give Update On Result. So Visit Our Site and Get Update.